I wore this quick, comfortable outfit a couple of times over the holidays. The cozy sweater plus tight skirt combination and bee necklace (my all-time favorite piece of jewelry) made it a winner in my book. Ah, your bee necklace is super cute!!! Your bee necklace is so dreamy! <3 and I love your red skirt - I've been obsessed over wearing mine lately! Gorgeous!! And your body in bangin' in that skirt!!! And your bob looks bangin' too!! AND the comfy sweater!! This outfit definitely deserves repeat, repeat! A giant bee! That's so awesome! Why do I never find such amazing vintage things? Love it! I love the slouchy sweater look right now! I love the sweater! I just picked one up that's similar at Old Navy because of this. I'm always so inspired by your blog. What an adorable outfit. Your hair is simply amazing! Agh! I love this outfit. The combination of fits, colors, and textures is just sublime. You make simple look so good! The color of your skirt is so bright and fun! I love the sweater paired with it. 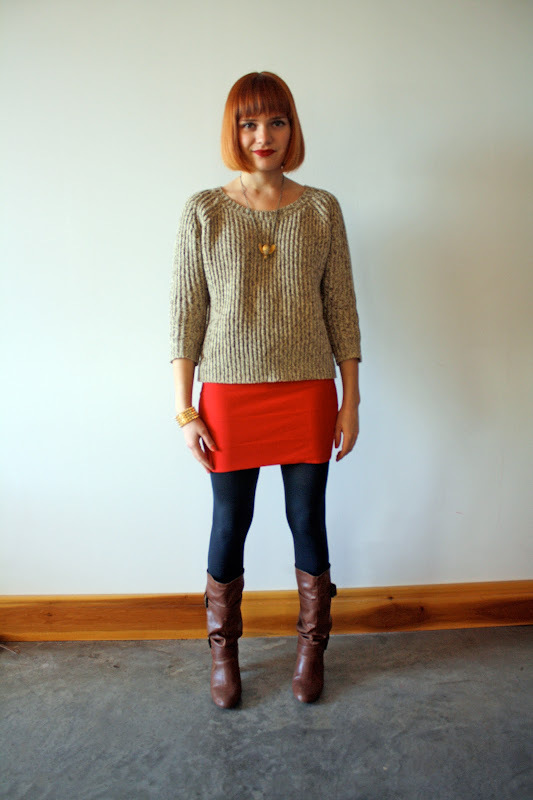 love a chunky knit with a fitted pencil skirt, especially a brightly colored one. and you just reminded me of a large dragonfly pendant that i have, love, and rarely wear.... time to dust her off!